A second series of ‘Magical Sites’ about Irish archaeology for a young audience begins on RTÉjr on 31st October 2016. This RTÉ-produced series will introduce Ireland’s National Monuments to the youngest viewers, those aged under 7, and their co-viewers. We have now confirmed that the series starts next week on RTÉjr. Programme 1 is on Monday 31st Oct, Programme 2 on Tuesday 1st Nov, and so on for 3 weeks – 15 programmes in all. (Programme 9 will air on Thursday 10th November.) The times on RTÉjr are 2.45pm and 4.30pm, Mon-Fri, however the shows have also been airing since Monday on RTÉ2 at 6.35am. Episodes 1 and 2 are already available on the RTÉ Player. The second programme in the new series of Magical Sites was filmed in the beautiful setting of the Céide Fields in Co Mayo in May of this year. A young boy (played by David Calleary) dressed in Iron Age clothes is helping his father (played by Damian Martin) to build a stone wall. Meanwhile a group of modern-day children arrive on the site and learn about the ancient farmers who once lived there and about the wild animals that roamed the countryside. They discover how archaeologists found the location of walls and paths buried beneath the ground using metal probes.The children try this out for themselves – they each take a turn. One of the boys lingers and gets separated from his friends: when he goes looking for them he meets the Iron Age boy building a wall and they talk about ancient and modern farming techniques. Seamus McDermott, Keenagh, Caoimhe Rogers, Ballina, Paul Forde, Carramore Lacken, Ciara Martin, Knockmore. We’re at one of the smaller burial locations at the site of Carrowmore, Co Sligo. The scene is set by the mounds which are scattered all around the large Listoghil cairn. A young shepherd boy is minding a lamb. He is also pottering about with bowls of dye and bits of wool. We see a group of current-day children wandering into the extensive Carrowmore site and beginning to explore the tombs, dolmens and large stones scattered all over the site. The children get separated and one girl wanders off towards the boy with the lamb. The boy can see the girl in her unusual modern clothes and he talks to her. He tells her that this place is theirs, that they have family buried here, and that they’re farmers. She pets the lamb and the boy shows her how he is dying the wool, explaining how he makes different colours with lichen, berries and bark. He is intrigued by the colour of the girl’s knitted headband and asks her how did she dye them? No, she didn’t dye it herself but she did knit! After a while, the girl’s friends happen nearby and the girl goes to get them. She’s thinking of introducing them to the little boy with the lamb but he and his family have moved away. We have now confirmed that the series starts next week on RTÉjr. Programme 1 is on Monday 31st Oct, Programme 2 on Tuesday 1st Nov, and so on for 3 weeks – 15 programmes in all. (Programme 9 will air on Thursday 10th November.) The times on RTÉjr are 2.45pm and 4.30pm, all Episodes will also be available on the RTÉ Player. OPW staff at the Visitors Centre in the Ceide Fields, among them Guide Supervisor Greta Byrne, were on hand to help out during filming. Congratulations to students of Fiona Bourke School of Speech & Drama, Ballina & Belmullet who will feature on RTE’S Magical Sites this autumn. Magical sites explores Early Christian Era settlements, medieval monasteries and castles, and the natural landscapes around them. Produced and Directed by RTE’s Niamh Guckian, the students were filmed at Ceide Fields and Carrowmore megalithic site. 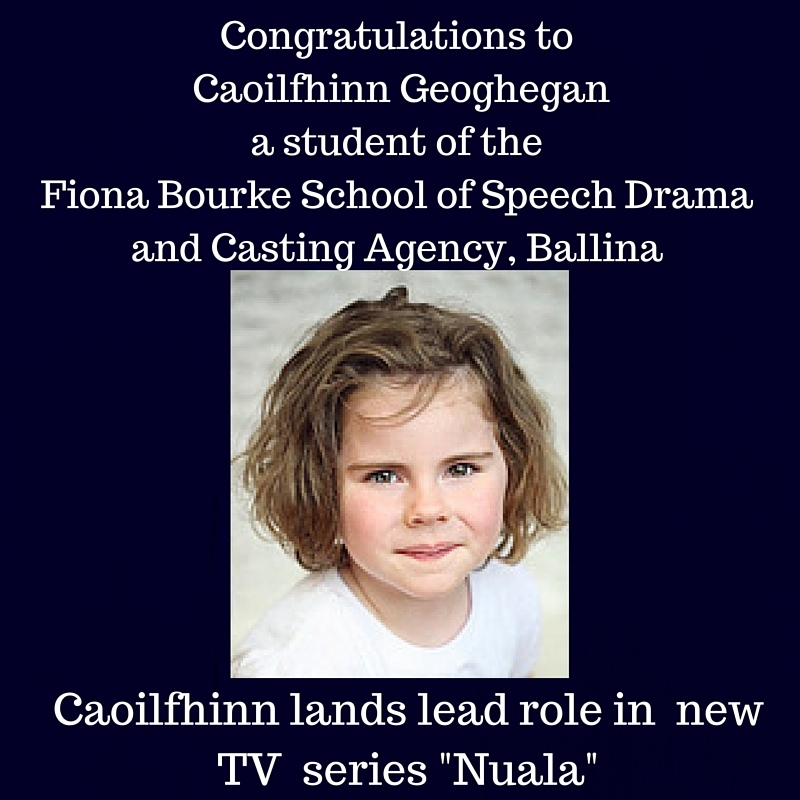 Caoilfhinn Geoghegan (6) from Castleconnor has landed the lead role of Nuala in the pilot of the same name. 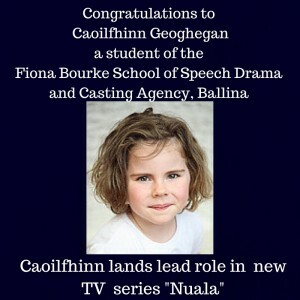 Caoilfhinn applied to audition on the advice of her speech and drama teacher Fiona Bourke with whom she has been a student since the age of three. Caoilfhinn is daughter of Michelle Lavelle and Enda Geoghegan, Castleconnor. 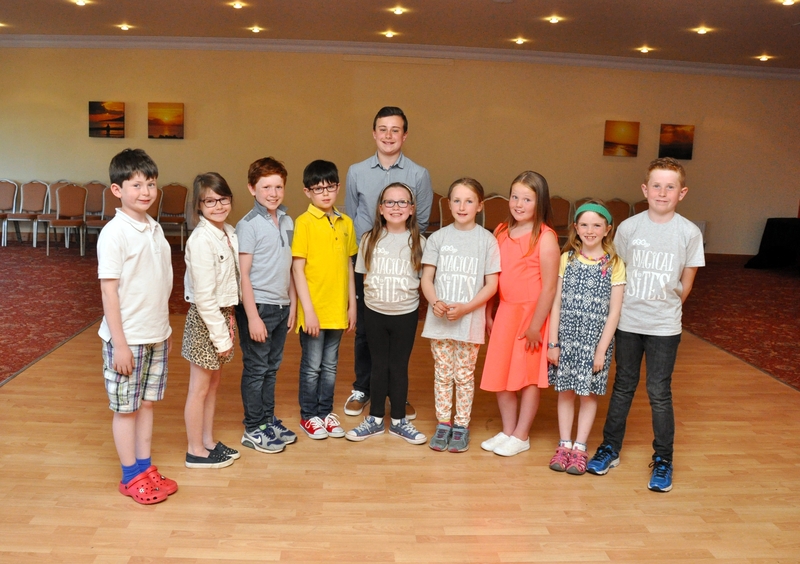 Cinetex, the independent production company who are making the pilot, held auditions for the roles and saw over 150 children over three days in Westport and Tourmakeady. The standard was incredible and the producers then had the unenviable task of whittling it down to the final three. Kayla Browne (10) and Ella Browne(9), who are real life sisters and will play Nuala’s older sisters Roisin and Ailbhe, hail from Castlebar. The well-known Galway actress Tara Breathnach (Tina in Ros na Rún, A Nightingale Falling, The Last Days of Anne Boleyn) is playing the role of their mammy. 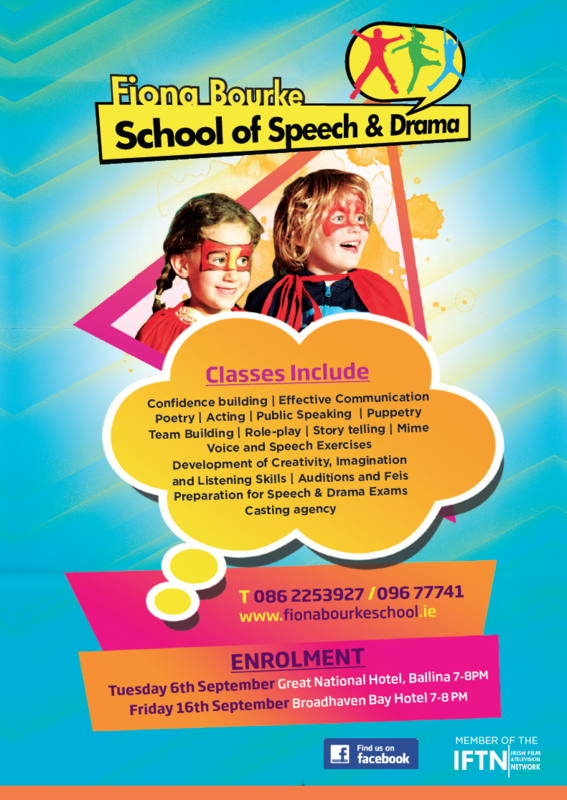 Fiona Bourke School of Speech, Drama and the Gaiety School of Acting have once again teamed up for another memorable Acting Course. 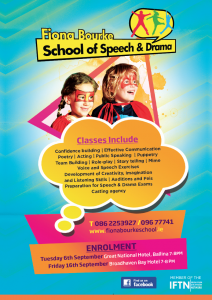 ‘I did three workshops with young people from The Fiona Bourke School of Speech and Drama in May of this year. I found Fiona fantastic, and brilliant with the kids and I got a real sense of a happy school that works hard but has fun too. In all three workshops I found the young people were charming, outgoing, confident and enthusiastic. marks in recent Irish Board of Speech & Drama exams. Students from six years old were awarded Gold medals for very high standard..